The cat and mouse game continues. Americans are beginning to reap more of the benefits of 2009's landmark credit card protection legislation, the CARD Act, even as some banks continue to add fees. The Act ordered banks to review credit card customers' files to determine if their interest rates should be lowered. According to this National Public Radio story, it's apparent that at least one of the "big four" banks -- Bank of America -- is cutting some high-value cardholders' interest rates by as much as half, even as it adds $59 annual fees to customers who are least likely to be able to get another card from a different issuer. "The divide that's dividing the haves and have-nots has gotten even bigger," Curtis Arnold, founder of CardRatings.com, tells WalletPop. "As we come out of this credit crunch, my concern is it's almost like a disappearing middle class. That's a concern to me as a consumer advocate, because millions and millions of consumers fall into this category," he says.As per the CARD Act, a hike in someone's interest rate has to be followed six months later by a review to determine if the raise is still justified based on the cardholders' payment history and credit score. What this means for consumers is that if you missed a payment and watched your APR soar into the stratosphere, you could have a light at the end of the tunnel. Right now, the numbers aren't great; according to one analyst cited, only 2% of Bank of America's credit card customers have been granted a rate reduction. There also are some indications that customers are getting their rates lowered, but only by a percentage point or two. Furthermore, since banks don't have to publicize the details of who's been granted a lower rate, it's possible that they could be going to people who don't generally carry a balance. This would, of course, make for good press without really helping any of the Americans struggling to pay their bills. 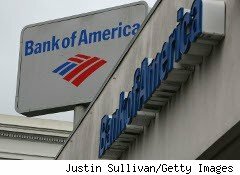 To add insult to injury, the Los Angeles Timesreports that Bank of America is adding a new $59 annual fee charged to 5% of its credit card holders starting next month -- and the paper claims the 5% are those who can't afford to pay off their balance or go someplace else to get a new card. Of course, a Bank of America spokesperson points out, these people could close the card and avoid the fee, but if the card in question is their only or primary line of credit, this could damage their credit scores, making it even harder to get credit again in the future. The Times reporter, David Lazarus, blasts Bank of America in his article, saying, "Introduction of an annual fee thus skirts the law by allowing a bank to milk extra revenue from an account without raising rates." Arnold also says banks aren't playing fair. "It's a catch-22. You can't rebuild credit if no one will give you credit, and that catch-22 is stronger than it's ever been. Honestly, my interpretation is the banks still hold all the cards."